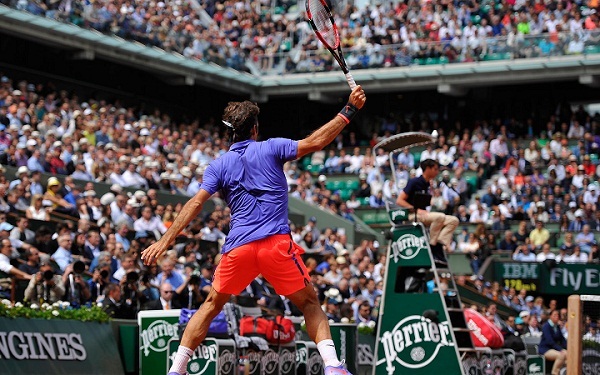 Roger Federer reached R4 of the French Open with relative ease, getting it done in 3 sets. 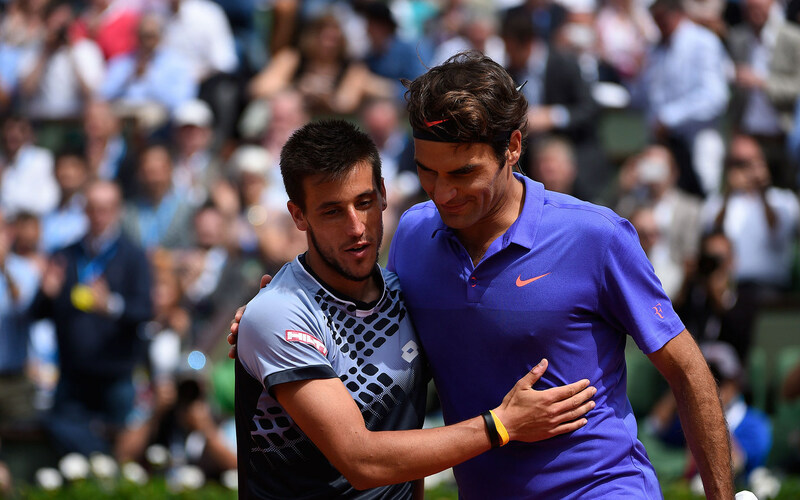 Roger faced a new opponent, self-confessed Federer Fan, Damir Dzumhur. It took the Maestro a few games in the first set to figure out Damir’s style of play. But once he picked up on it, young Damir began to feel the impact of facing the FedExpress. Serving at 2 all, Damir was broken by Roger. From then on, despite hanging on in his own games, he never got a look into the Swiss’ serves meaning Roger faced no breakpoints in this set. Roger dutifully served it out to take the set 6-4. The second set started with Roger breaking Damir right away but then quickly went down 15-40 on his own serve, trying to consolidate the break. It should be mentioned here that the conditions were very windy indeed which certainly disturbed the Maestro. Roger eventually held to go up 2-0* but Damir continued to frustrate him with exquisite dropshots which irritated the Swiss to no end, even making him howl in frustration at one point. Damir got on the board and then put the pressure back on Roger who had to save yet another breakpoint before ultimately holding to go up 3-1*. Roger continued to pressure Damir and lo and behold, got another break to go up 4*-1. An easy hold took the score to 5-1* for the Swiss with Damir having to serve to stay in the set. Damir held and you would think Roger would be able to serve it out but suddenly the score became 30-40 with a breakpoint for Damir. That changed to deuce and then a set point for Roger which he missed and somehow Damir got yet another breakpoint chance. Finally the Bosnian took it and unexpectedly, instead of starting set 3, Damir was now serving to continue set 2 longer. But Roger had gotten annoyed enough at this turn of events and he quickly got 2 breakpoints on Damir’s serve which were also set points. An insane flicked backhand cross-court shot ensured we were done with this set for good, at 6-3. Damir had plenty to be proud of for his first outing on Chatrier and that too against his idol. It must have seemed a bit surreal, at least in the beginning. But then he got into the match quickly enough and we got to see his pretty dropshots and fantastic foot speed. Roger enjoyed the match and thought it was entertaining and even clapped at one of Damir’s amazing shots. He gave him a warm hug at the net and I wouldn’t be surprised if we hear the Swiss bringing him over to Dubai in an off-season in the future to practice with. Here is a clip of Roger’s presser, an interview he did after the match (thanks to Pika for uploading it!) and a tiny highlights clip. Up next is where things start to get a whole lot tougher. In R4 our champ will face Gael Monfils. The past 4 matches they played (3 in 2014 and 1 in 2015) have split results with Roger winning both hardcourt matches and Gael winning both clay ones. Monfils has played two 5 setters back to back this French Open but he thrives on 5 setters. Given the athlete he is, I am sure he has recovered from them adequately enough. Plus if there was ever a player who loved the spotlight, it’s Gael. And what better spotlight could there be than facing off against Roger Federer at Roland Garros on Chatrier with the 14,000+ raucous French crowd cheering against the Maestro? Well there was such an occasion last year, in the Davis Cup final. That match was also a best of 5 sets and on clay and one which Monfils won in straight sets. But as we know, Roger was injured then, though Gael played brilliantly regardless. However, the match at Monte Carlo this year when they faced off is a bit more concerning. Gael won in straight sets yet again and Roger looked completely lost. But the French Open is a different beast altogether. Plus since Monte Carlo, Roger has found more form on clay, reaching the final in Rome. And Roger has faced him before at Roland Garros as well, thrice. And the Swiss won on all three occasions. In other words, I have no idea how this is going to go. Not only is Gael unpredictable, but this year Roger has been inconsistent as well. So the possibilities for how this match could turn out seem endless. All we can do is be prepared for a rude crowd, Monfils’ trick-shots and fake-outs and also Gael having to tie his shoelaces every time he feels the match is going too fast. Most of the time this will happen when Roger is about to serve and no matter how many times I’ve see him do it, it irritates me every single time. At least Roger knows what he’s getting into. Roger himself has been particularly shout-y and expressive this French Open but so far he has managed to channel his frustrations the right away. Hopefully today will be no different. The match is the 3<sup>rd</sup> of the day on Chatrier. C’mon Maestro! Let him have it!